Judge In Pistorius Trial Rules Out Murder : The Two-Way South African Judge Thokozile Masipa, who has yet to render her final verdict in the jury-less trial, says the prosecution failed to prove premeditated murder. 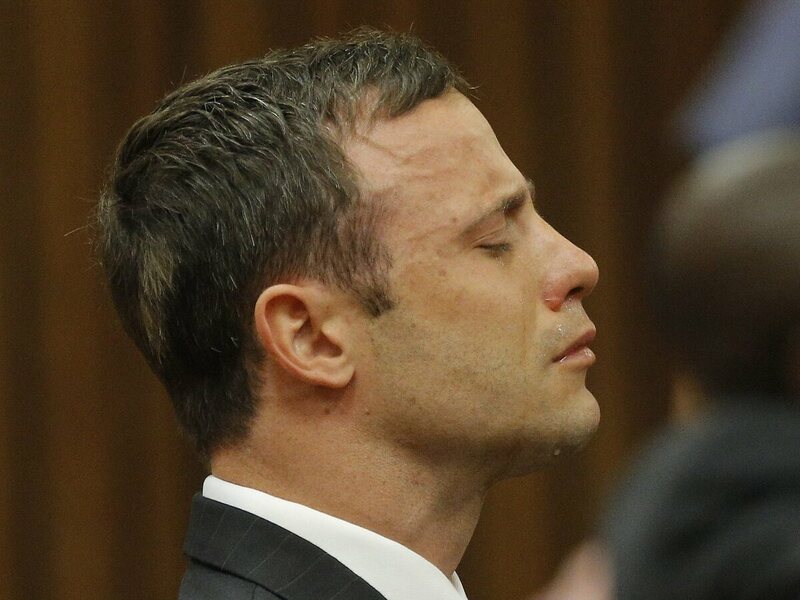 South African athlete Oscar Pistorius cries while the verdict is being read during his murder trial in Pretoria, South Africa, on Thursday. Oscar Pistorius, the South African double-amputee Olympian accused in the shooting death of his girlfriend, model Reeva Steenkamp, has been acquitted of the most serious charge of premeditated murder. But South African Judge Thokozile Masipa has yet to announce her final verdict in the jury-less trial, although she has hinted that culpable homicide would be a "competent verdict." As tears streamed down Pistorius' face, Masipa told the court in Pretoria that the athlete did not plan to kill Steenkamp on the night he fatally shot her through a closed bathroom door. "Clearly he did not subjectively foresee this as a possibility that he would kill the person behind the door, let alone the deceased, as he thought she was in the bedroom," Masipa said. "Culpable homicide is a competent verdict," she said without delivering her formal decision. Culpable homicide refers to negligent murder and is roughly the equivalent of manslaughter in the U.S. criminal justice system. In the lead-up to announcing her verdict, Masipa said prosecutors had not made the case for a conviction on premeditated murder. Pistorius is a hero to many in and outside South Africa, earning the nickname "Blade Runner" because of the high-tech carbon-fiber blades that helped propel him in the Olympics and Paralympics. The drawn-out trial, with its mix of celebrity, wealth and murder, has drawn comparisons to the O.J. Simpson trial in the U.S. nearly two decades ago. Pistorius' defense team argued that the killing of Steenkamp on Valentine's Day 2013 was a tragic accident and that the track star fired four shots through a bathroom door in his home believing he was targeting an unknown intruder. But the prosecution questioned why an intruder would have locked himself in a bathroom, why Steenkamp would not have identified herself and why Pistorius would not have known his girlfriend's whereabouts. Attorneys for Pistorius also faced a challenge in convincing the judge to disregard the accounts of a married couple who were among the first witnesses for the prosecution. Michelle Burger and Charl Johnson lived near Pistorius in Pretoria and testified that they heard a woman screaming before shots were fired. Another married couple living near Pistorius, however, testified that they heard a man screaming in a high-pitched voice.